AverageBro: Today's Obligatory "Fox News Is Racist" Post. Today's Obligatory "Fox News Is Racist" Post. One of my favorite places to blow a few minutes is The Fox Nation, a Huffington Post-style offshoot of the Fox News website that mostly consists of blurbs of stories and outgoing links to other news and opinion sites. There's seldom, if ever, any actual "news" on the site. Its appeal is entirely centered around its tendency throw up outlandish headlines, and the ensuing trail of outlandish comments that follow it. 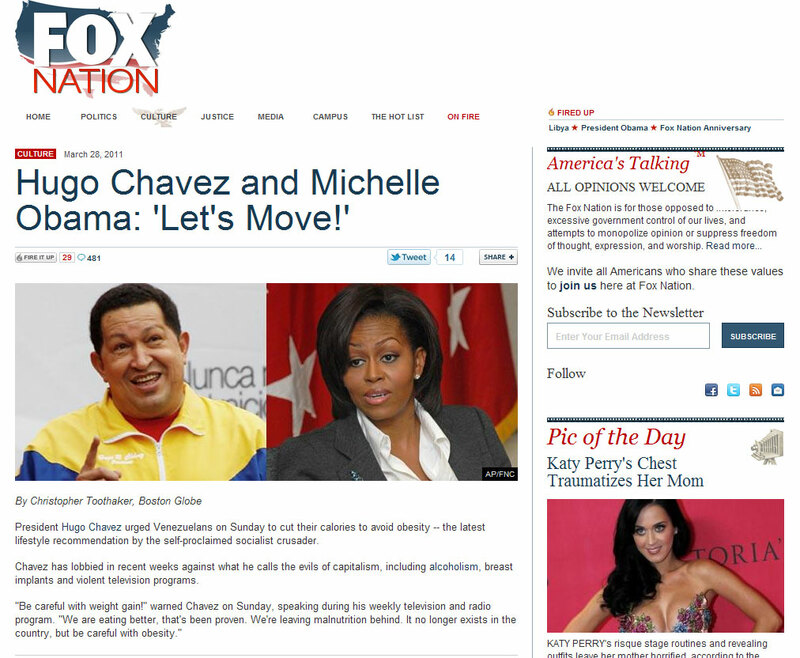 This is probably best illustrated by the following headline "Hugo Chavez and Michelle Obama: 'Let's Move! '", which presumably ties first lady Michelle Obama to Venezuelan tyrant Hugo Chavez. The culprit: both (apparently) want people to eat less fatty foods and work out a bit more (the horror!). Of course, the (not so) odd thing is that the Boston Herald story that's excerpted doesn't mention Michelle Obama or her signature "Let's Move!" campaign a single time. Not once. None of this matters of course. All that matters is that the table's set for The Fox Nation regulars to go in on the first lady. And go in, they did. Seriously, all jokes aside, I wonder exactly what the point of this is. It would be less than intellectually honest to make a news organization (or any website, including mine for that matter) responsible for the actions of their commenters, most of whom aren't even required to actually register to leave their opinions on said site. Still, I can't help but think (okay, know) that Fox News intentionally throws misleading headlines out there as bait, knowing that the typical commenter there is just salivating for red meat (and a green light) to engage in racist, sexist, homophobic drivel in return. They clearly know the sentiment is out there, they're simply feeding the beast. Truthfully, this isn't too far removed from the television network itself, which uses a similar approach to reel in viewers. We all know the Obama Birth Certificate nonsense was settled years ago, but watching Fox News and their various paid contributors give this story its 10th life, I can't help but wonder if there's an intellectually honest person on that network. Even the typically classy Geraldo Rivera recently got in on the party, giving Donald Trump a full segment to question Obama's legitimacy without even token resistance to the contrary. And I happen to like Geraldo, but this is just plain lazy "journalism". I know I sound like a broken record by now, but I think it bears repeating: The election of Barack Obama was the single worst development in American race relations in two generations. And it has nothing to do with Obama himself, but rather the legions of crazies that his ascent has awoken in the craziest of ways. Personally, I preferred my racism when it was still underground. Shoot me. Question: Is all of this above ground "postracial era" racism tiring, or was I just not paying nearly as much attention until now?